So baptism has something to do with our salvation, BUT I thought that only happened by grace alone through faith alone! This is absolutely true, so then somehow baptism is a part of God’s sovereign, gracious working of faith in us. In other words, baptism is the physical link between God’s grace and our faith. You must be baptized in order to go to heaven. You can’t be saved yet if you’re not baptized yet. The grace of salvation can flow through baptism in reverse order – God works outside of time and inside time at the same time. (In other words, it’s easier to believe these promises rather than to try and map them out mathematically). That babies are proper candidates for baptism. Baptism is the physical reception of the grace that God is promising us in the gospel – children can be and are saved by the same grace if they die young – God doesn’t have to work His saving grace through baptism. It is simply His chosen means of bringing us into visible communion with the church once we are professing believers (disciples). That the churches that baptize babies are necessarily doing something bad. For nearly the entire church age, Christians have been baptizing babies, and God has not absolutely cut off these brethren and their churches from the fellowship of the gospel. Infant baptism is an error of timing, but God will still work through those baptisms – it’s just that the intended impact is lessened for the person baptized as a baby. They miss out on being able to consciously submit to the gift of the gospel in the water of baptism. This error is even worse when (like in Lutheran churches and in a different way the Roman Catholic Church) the baby is believed to be saved and born again at the moment of baptism. They grow up then being held accountable for a salvation they may never have received. There is a similar problem in Reformed and Presbyterian churches, as well as in Anglican and Eastern churches. Baptismal regeneration is not a 1:1 event bound in time to the moment of contact with the water. It is, in fact, a means of increased judgment and accountability for the person being baptized, as he or she is being visibly identified as a member of the church. This should be entered into with sober judgment. Baptism is when we are holding out our empty hands to God, saying “give me all you have for me in Christ Jesus.” The one who does this, and then walks away in apostasy is in far greater danger on the Day of Judgment than the one who never sees baptismal water. And out of all the churches of Christ, I believe it is the Baptist and evangelical churches that are most in serious error here (excluding Rome, who does not have the gospel). Why? Because we Baptists categorize baptism as primarily a step of obedience wherein we are giving God something (a promise, or a commitment of being publicly identified with Christ). 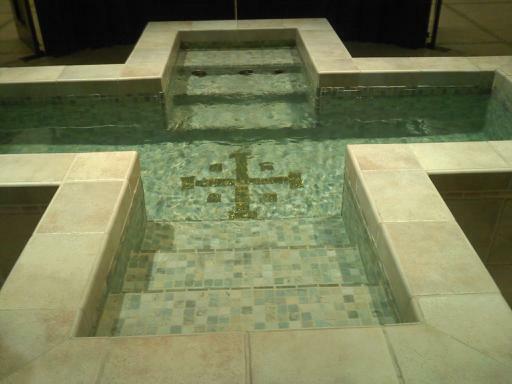 Baptism is those things, but only secondarily, just like our choosing of Christ. Do you see what I mean? Yes, we choose to believe in Jesus, but our choice is effected by God’s grace in the gospel. In the same way, our baptism is an act of obedience, but it is only possible and effectual because of God’s initiative, His promise, and His powerful embrace of us in adoption. In other words, baptism is gospel. It is Jesus, touching us with the saving grace of His cross work, using water as the medium, and only within this primary definition can we see our limited, derivative role of submission in obedience. I don’t think I will have anyone agreeing with me here, but I would debate and fight to prove that my view explains all the other views within the catholic churches of Nicaea. This entry was posted in Justification, Lutheranism, Reformed Theology, Roman Catholicism, Sacraments and tagged american evangelicalism, baptism, Bible, Church, discipleship, infant baptism, sacrament. Bookmark the permalink. ← Whose Sin was Greater, Peter’s or Judas’s?